WW2 saw the nations of the world investing massive amounts of manpower and money into the development of better ways to extinguish life in hopes of turning the tide of the war in their respective favors, sometimes including coming up with outlandish contraptions like (surprisingly effective) bat bombs and pigeon guided missiles, anti-tank dogs, flying jeeps and tanks, suicide torpedoes, super ships made of ice, and even balloon bombs randomly sent out with the hope they might land somewhere thousands of miles away on enemy soil. Today we’ll be looking at another notable WWII weapon, the V-3 cannon- a piece of artillery capable of hitting a target more than 100 miles (165 km) away, shooting its projectiles at around 3,400 mph (5500 km/h)! Technically defined as a “supergun”, a term given to guns of such comically large size they need to be categorised separately, the V-3 was 430 feet long (131 metres). This massive size meant that the gun had to be built already aiming at its target and could only reliably hit a target the size of a city, a fairly minor trade-off considering the weapon’s nigh-unparalleled range for a non-rocket based weapon. The V-3 was able to achieve the incredible projectile range due to a rather unique firing mechanism that utilized multiple smaller explosions, rather than one big one, along the length of its barrel set to go off just as the projectile passed these side chambers. This allowed the supergun to fire its payload at extreme distances without damaging the barrel, which had proved to be a problem for other, similarly massive guns. Notable here, for reasons we’ll get to in a minute, is the so-called Kaiser Wilhelm Geschütz (quite literally, Emperor Wilhelm Gun). This was a 200 ton, 111 foot long gun used by the Germans to shell Paris during WW1. It could only fire around 60 rounds before its entire barrel needed to be replaced due to damage from the explosions used to launch its 106 kilo or 236 pound shells. The projectiles also had to be numbered and fired in a specific order, with each one slightly bigger than the previous one to account for the increasing diameter of the barrel as the massive cannon was fired each time. The Emperor gun was so powerful, it was noted for being the first man-made invention to launch an object into the stratosphere, with the shells it launched peaking at an altitude of around 40 kilometres during flight. The range of the gun was so unthinkably extreme for such a weapon that the 80 man team in charge of firing it had to aim a little under a kilometre “to the left” of the target to account for the Coriolis effect. The French military genuinely suspected for a time that these projectiles were being launched from super-high Zeppelins hiding behind clouds because the idea of them being fired from a gun up to 75 miles (120 km) away was deemed to be too absurd. 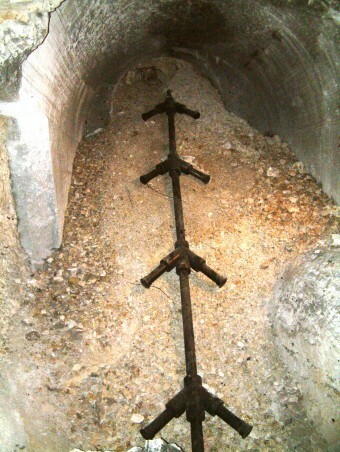 Virtually all records of this gun’s existence and how it was constructed were destroyed towards the close of WW1. Nonetheless, it was known to the French and in response they drafted plans for an even bigger gun that utilised multiple explosions to launch projectiles a similar distance. Sound familiar? These plans were ultimately archived by the French after WW1 and were found by German soldiers in 1940 who then passed them onto August Cönders, the guy who designed the V-3 cannon… In other words, the only reason the V-3 cannon was even invented is because the Germans found plans at the start of WW2 explicitly drafted to counter another giant gun they’d used during WW1. In any event, beyond its massive range, a battery of V-3 cannons could fire close to 300 shells an hour, or roughly one shell every 12 seconds. This is a fact that piqued the interest of Hitler himself, who enthusiastically granted the project near unlimited support when existence of a prototype was brought to his attention in 1943 by his advisor, Albert Speer, even though said prototype had yet to fire a single shell. With Hitler throwing everything the German military had at its disposal behind the project in mid-1943, the V-3 cannon, dubbed the “Hochdruckpumpe” or “High-Pressure Pump” during construction to hide its purpose from spies, went from the idea phase to construction almost immediately. Since Hitler wanted to use the gun to shell London, and the gun had to be built aiming at its target, the location had to be somewhere in Northern France. 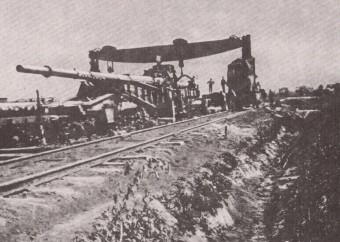 The gun also needed to be built within close proximity to a railway (due to the size of its ammunition which could only be transported effectively via rail). Luckily for the Nazis, an ideal location was found in the form of limestone hill located in the French hamlet of Mimoyecques in Landrethun-le-Nord. The location was deemed ideal as the chalk that made up most of the hill would be easy to excavate but was ultimately strong enough to tunnel through to create the underground infrastructure needed for the weapon. Construction of 50, V-3 guns began in earnest in September of 1943 utilising a combination of drafted German engineers and Soviet POWs. The initial plan was for two separate facilities to be constructed roughly 1000 metres apart, each housing 25 V-3 cannons built into drifts dug into the hillside. They also planned to build tunnels connecting each facility that would be used for storing the shells, which in turn would be transported to the guns via an underground railway. Amazingly, construction of most of the underground tunnels was completed. 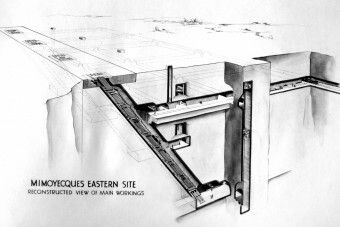 However, construction of the guns themselves was severely hampered when the allies learned of a German plan to attack London using an unknown superweapon in the latter stages of 1943. Knowing that the Germans were planning something at Mimoyecques, and putting two and two together, the RAF doggedly attacked it throughout the last few months of 1943 and the first half of 1944. This led to the proposed number of V-3 cannons dropping from 50 to 25 when the RAF destroyed the Western-most site. This was further reduced to 5 following a bombing run utilising “tallboy” bombs specifically designed to destroy fortified bunkers on July 6, 1944. Plans were dropped altogether in on July 30th that same year due to the advance of allied ground troops. The allies wouldn’t actually learn about the existence of the V-3 cannons until after the war, at which point then Prime Minister Winston Churchill was reported as saying that the site could have been responsible for the “most devastating attack of all on London”. 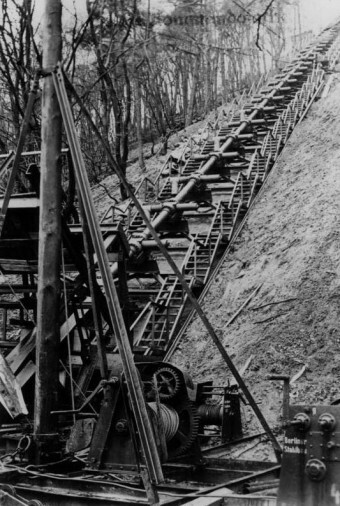 Although the Nazis never got a full-size V-3 cannon working during WW2, they did manage to construct two much smaller versions of the weapon with which they shelled the recently liberated Luxembourg from a somewhat less impressive distance of 43 kilometres (26 miles) away in late 1944. Smaller, but still impressively powered, these mini V-3’s were capable of shooting off their deadly projectiles at speeds of over 2,000 mph or 3300 km/h. Despite the impressive specs, and with the guns firing hundreds of rounds (142 of which hit Luxembourg), only 10 people were killed and 35 wounded as a result. While the Nazis tried desperately to use the gun again, even deploying one during their last major offensive of WW2, Operation Nordwind, they never actually successfully fired another version of the V-3 again during the entire war, giving these guns a laughably low kill rate given the resources put into them. Today the failed location of the French battery has been converted to a museum containing what remains of the guns. The “V” in V-3 Cannon stands for “Vergeltungswaffen” which quite literally translates to “reprisal weapons”. These were a series of long-range weapons developed by the Nazis with the main goal of bombarding their enemies from extreme range. The most famous of the three weapons developed under this program is arguably the V-2 rocket, the first long-range guided ballistic missile ever created. The basic design of these weapons infamously served as the basis for the rockets that eventually took us to the Moon. Vergeltungswaffen were part of a larger range of weaponry and equipment developed by the Nazis during WW2 simply referred to by Nazi propagandists as “Wunderwaffen” (literally Wonder Weapons). Though many of these Super Weapons never made it out of the prototype stage, several were remarkably sophisticated for the time. Examples of such weapons include the Messerschmitt Me 262, the first operational jet fighter that was so fast (541 mph) allied planes literally couldn’t shoot it down. On the plus side, the Me 262 pilots also had trouble shooting down Allied planes because they went too slow to have time to target them well. Slowing the Me 262’s down for a dogfight was also ill-advised because they performed extremely poorly at low speeds and the engines tended to flame out if the pilot tried to increase speed too quickly; so slowing down for a bit and then trying to jet away didn’t really work. The Nazis also developed the Sturmgewehr 44, the first assault rifle, the Zielgerät 1229, a night vision scope, and, of course, the Kugelpanzer, a one man tank shaped like a ball. Any chance we could renew our efforts re: watching our apostrophes? I make it two “German’s” and one “Nazi’s” in this piece. C’mon people, we can do better. @David Clark: Thanks for catching those, fixed!